The removal or reduction of environmental contaminants such as heavy metals, e-wastes, organic and inorganic pollutants from contaminated sites using nanoparticles formed by algae, fungi and bacteria with the help of nanotechnology, is called nano-bioremediation. If such environmental contaminants are reduced/removed using nanoparticles produced by or involving higher plants, it is regarded as nano-phytoremediation. Nanoparticles are very small atomic or molecular aggregates with dimension between 1 nm and 100 nm that can drastrically modify their physico-chemical properties compared with bulk material. Some types of nanoparticles include: natural nanoparticles such as volcanic dust, lunar dust and mineral composites; incidental nanoparticles that result from anthropogenic activities such as diesel exhaust, coal combustion, welding fumes; and engineered nanoparticles which include nanogold, nanozinc, nanoaluminium and titanium dioxide. 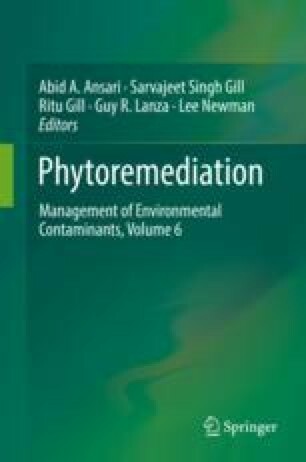 As in phytoremediation, there are different types of mechanisms for nano-phytoremediation. Thus, there may be nano-phytodegradation, nano-phytostabilization, nano-phytovolatilization, nano-phytoaccumulation, nano-rhizofilteration and nano-phytohydraulics, depending on the processes involved. Nanotechnology increases phytoremediation efficiency in that the nanosize of particles makes it possible to reach otherwise inaccessible areas and hence promote in-situ remediation, among other things. Nano-phytoremediation facilitates the degradation of resistant complex organic compounds into simpler compounds by the joint activities of microbes and plants, enhanced by nanoencapsulated enzymes. Nanoparticles such as nanosized zero valent iron (nZVI), manganese oxides, cerium oxides, titanium oxides and zinc oxides have great affinity for metal/metalliod absorption.This affinity, in conjuction with their high number of active surface sites and their significant surface area make them effective for remediation of various contaminants, such as 2,4,6- trinitrotoluene, e-wastes, polychlorinated biphenyls, heavy metals, endosulfan and so on.